Windstream has, at long last, made the decision to take its fiber footprint to the west coast. They have announced plans to add fiber routes across the Rockies to bring the markets of Salt Lake City, Reno, Las Vegas, and Silicon Valley onto their physical network this year, with further plans to add additional western routes and markets next year. The initial expansion leverages dark fiber to expand its 100G network out to California from Denver by the end of 2016. 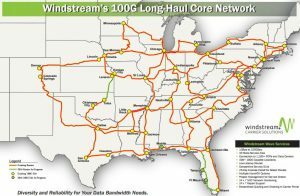 Once that initial buildout is complete, Windstream has a second phase that will add a southern route built on dark fiber between its Texas markets and Los Angeles via El Paso and Phoenix as well as connectivity along the California coast that it expects to finalize by the end of 2017. In all, the company will add some 4,800 route miles to the company's network. Windstream's current nextgen longhaul backbone (left) has been built off of Infinera's DTN-X gear, and the new routes they are adding will of course use the same technology. Windstream already has some metro assets in the west of course, notably in Salt Lake City for example, and has long had customers out there that it acquired via the PAETEC acquisition and serves via leased assets. This expansion connects some of those metro islands and enters new markets at the infrastructure level, bringing more of its customers on-net and offering new opportunities at the wholesale level. Windstream's wholesale offerings will now be able to better address wavelength deals that need fully national 100G reach. So what's next beyond California? I'm sure the Pacific Northwest is on the company's wish-list just to complete the set, as today's expansion does not describe a fiber route to Seattle or Portland just yet. It doesn't take much imagination to come up with a third dark fiber expansion there. I have long thought that perhaps Windstream might take the inorganic route to the west coast by making a play for Integra/Electric Lightwave. They could still make that move, of course, but the company's plans to build out more organically suggest nothing is particularly imminent on that front. Next: Japan-Saudi alliance: A gamechanger for tech investment?